April 2, 2018, 8 a.m.
By Ruchi Kumar @RuchiKumar April 2, 2018, 8 a.m. There still aren’t many newsstands in Kabul. And there still aren’t many print newspapers or magazines in circulation to fill those stands — the once-vibrant media industry of Afghanistan was among the many sectors that had suffered through years of conflict. But in the past decade and a half, mass media, especially broadcast sources, has grown from just a few Taliban-controlled regime outlets to thousands of radio, television, and magazine, and newspaper sources. Business DNA, a new English-language financial magazine launched by a Kabul-based consulting firm Pearl Horizon, is setting its sights on potential readers with a business interest in stories about growing industries in Afghanistan, hoping a fresh lens will encourage entrepreneurship within the country and investment in new businesses. Companies based in Afghanistan face physical threats and frequent attacks, making it difficult to run a successful business. These fundamental security issues also discourage investors who see the risks involved in supporting news businesses as insurmountable. High levels of corruption within the Afghan government also present additional hurdles to sustaining a new company. Currently, the Afghan economy is heavily dependent on international donor support and international aid. Even some of its major industries rely heavily on foreign imports; sometimes basic services such as printing and graphic design are also outsourced (Business DNA is printed domestically). Business DNA, Edries said, will instead focus on profiles of successful Afghan companies, useful market information, best practices in management, future business opportunities, and economic analyses, and will target business owners and others at the management level, both local and international investors, and senior government officials involved in crafting the country’s economic policies. But it also hopes to find a wider readership among working professionals, mid-level managers, people interested in building startups, and students studying business and administration. Business DNA is available primarily in print. While the first issue the team put out in February was free, Business DNA will cost $50 for an annual subscription of six issues. The team has already distributed more than a thousand copies and wants to get 3,000 copies in circulation by next issue. Since its launch, Edries said, the publication has received about 300 individual subscriptions and 10 bulk or corporate orders, including from the country’s economic ministries and private universities like the American University of Afghanistan. Most of the magazine’s stories come from a team of seven writers and editors (all new hires, separate from Pearl Horizon Consulting except Edries), with additional contributions from technical experts from a few different industries. It’s also brought on a few volunteer editors based in Dubai, London, and the U.S. during the launch period to advise on story development. In the past few years, many more publishers have started to explore the relatively untapped periodicals market in Afghanistan with newspapers and magazines in Dari and Pashto, Afghanistan’s two major national languages. New publications such as women’s lifestyle magazine Gellara and female-led Radio Shaista have been tested, despite socio-political pressures and persecution. “We decided to start with print because we believe people, especially in Afghanistan, still like to read in hard copies,” Edries said. “Afghanistan has just started, and has a long way to go until its people have full access to internet and digital technology.” While studies on news consumption habits in Afghanistan are scarce, there’s been a noted rise in print readership — and more diverse print sources overall — in the post-Taliban years. The total population with internet access in the country is climbing but still low, at around 15 percent. Edries admits Business DNA is priced on the higher end, and that publishing in English restricts its reach. But “our content is unique and niche. We also print in high quality to ensure that it can be a corporate-level product,” he said, adding that Business DNA focuses more narrowly on attracting an audience in the business community, which is mostly fluent in English. (There also hasn’t been a comparable magazine catering to the English-speaking business community.) However, it will offer discounts on bulk orders (20 percent off the standard price for an order of more than 50 copies), and for students and those working on startups (40 percent). Currently, the team is extending the discount on a case-by-case basis. While Pearl Horizon provides the magazine with office space as well as access to its business network, Edries (who remains full-time at Pearl Horizon) continues to insist that the Business DNA is fully independent: “Besides me, the Business DNA is managed by a different team and makes decisions regardless of PHC’s preferences,” he said. “We have bootstrapped to establish Business DNA,” Edries said, emphasizing that they have no outside donors, as many new media ventures in Afghanistan have. “Our revenue model is based on advertisements and subscriptions.” Advertising currently makes up as much as 75 percent of Business DNA’s revenue, and Edries said he expects it to remain a major stream. (At least 16 pages of the 80-page glossy first edition of the magazine carried advertisements from local businesses including law firms, fashion labels, and even a Kabul-based cab service.) Business DNA also intends to produce in-house research papers about new markets and investor opportunities, which can be underwritten by companies; a number of companies have already pledged to finance such white papers, he said. Business DNA will rely heavily on advertiser revenue in an environment where several big businesses have been accused of operating on investments made from funds wrongfully acquired through the war economy, so the team will need to apply extra scrutiny when it comes to bringing on potential advertisers. Whether Business DNA will be able to maintain a large enough subscriber base to continue publishing will ultimately depend on the quality of its stories. 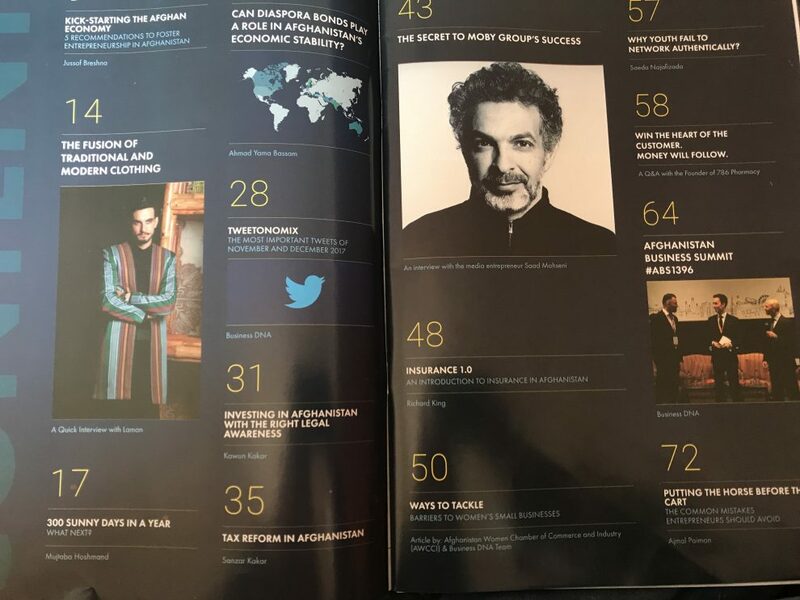 Its first cover story featured Saad Mohseni, the founder of successful Afghan media venture the Moby group; other articles covered the complexities of running a business in Afghanistan, with advice from experts on legal rights of a business and insights into tax reforms. Its next issue will focus on Afghan women in business, Edries said, though he declined to share more on specific stories. 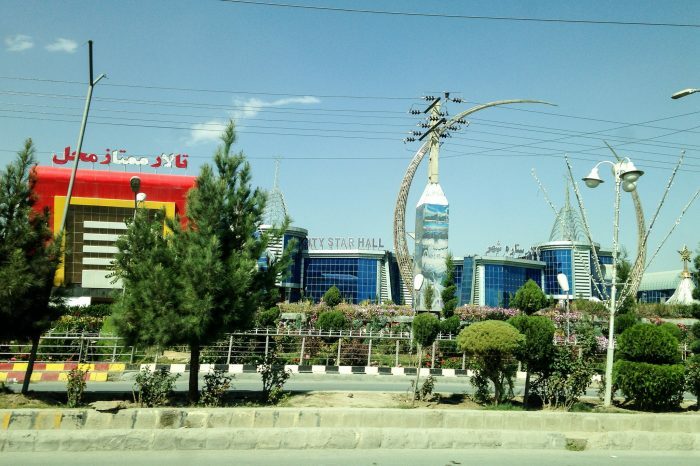 Photo of Kabul by the Center on Conflict and Development at Texas A&M used under a Creative Commons license. POSTED April 2, 2018, 8 a.m.
Kumar, Ruchi. "In Afghanistan, a new magazine wants to see if there’s a market for business news in English." Nieman Journalism Lab. Nieman Foundation for Journalism at Harvard, 2 Apr. 2018. Web. 20 Apr. 2019. Kumar, Ruchi. "In Afghanistan, a new magazine wants to see if there’s a market for business news in English." Nieman Journalism Lab. Last modified April 2, 2018. Accessed April 20, 2019. https://www.niemanlab.org/2018/04/in-afghanistan-a-new-magazine-wants-to-see-if-theres-a-market-for-business-news-in-english/.